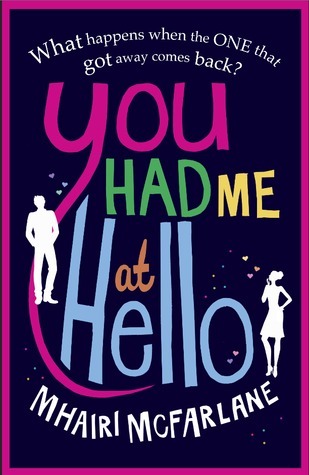 While not as addictive as her second book, I still found plenty to love in You Had Me At Hello. Work drama, friendship drama, love drama, life drama—there was lots of drama. Like Mhairi’s other book, this was really the kind of thing you’d want to see made into a big-screen romcom. My only qualms came from the overuse of flashback chapters. I kept finding myself wanting to get back to the present and see what was going to happen next. Still, there were some good moments and depths added to characters that those trips to the past added in. In her early thirties, living with her childhood boyfriend—turned—fiancé, main character, Rachel, practically flipped her life upside down backing out of an engagement she wasn’t sue she wanted to be a part of. I wholeheartedly supported her decision, not liking Rhys’ attitude in the slightest, and found this offered a great kick-start to the book. Bringing back an almost-love interest that got away, and was now taken—that was just the perfect kind of angst. Watching her pine after a now-married Ben, while trying to figure out her own life, it was all kinds of fun. Being a single person again after over a decade in one relationship, Rachel came across surprisingly together—at least for the most part. Although, wanting another woman’s husband isn’t exactly the best message to put out there, I think Rachel’s pining was handled fairly well, with it never really feeling like she purposefully setting out to break up a marriage. I think that came down to her support network. Without her close-knit group of friends to bounce ideas off, laugh, to drink with, I don’t know how things would have played out. A lot more flashbacks, I’m guessing. Contemporary fans who love digging into a bit of friendship and relationship drama.